Bangkok, November 2017 – X-ZELL, a global biotechnology firm specialising in rare cell detection technology, has partnered with Professor Dr Pornchai O-Charoenrat, Chief of the Department of Head, Neck and Breast Surgery at Mahidol University’s Siriraj Hospital, to trial the company’s new cancer cell detection test on 200 breast cancer patients across Thailand. The test, aptly named X-ZELL Breast™, makes use of the company’s world-first, patented platform technology to isolate and visualise rare, cancer-derived Circulating Endothelial Cells (CEC) in a small, 10ml blood sample. 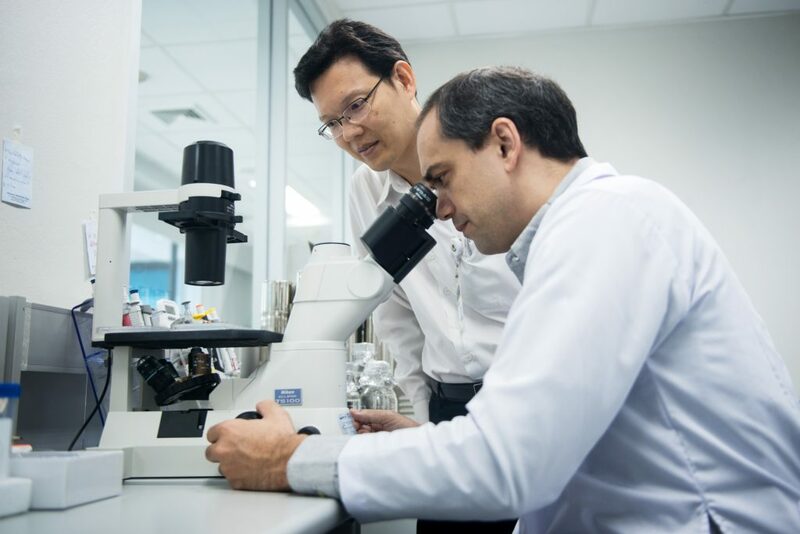 The resulting high-definition images of atypical cells may aid the diagnostic decision-making process, according to X-ZELL CEO, Dr Sebastian Chakrit Punyaratabandhu Bhakdi – especially if traditional diagnostic instruments such as mammograms and tissue biopsies have proven inconclusive. According to Dr Bhakdi, the landmark study with Siriraj Hospital is the first of its kind in Southeast Asia. “Results of a pilot study have already indicated that our test is able to reliably detect breast-derived cancer cells in a simple blood sample,” explained Dr Bhakdi. The new study, he added, will reaffirm X-ZELL Breast™’s utility for clinical use and pave the way for immediate market entry via Professor Dr Pornchai O-Charoenrat. “We feel honoured to be able to work alongside Professor Dr O-Charoenrat and commend him on having the foresight to embrace such a revolutionary technology early on. “As the leading breast cancer specialist in Thailand, Professor Dr O-Charoenrat is acutely aware of the huge unmet need for more accurate, non-invasive diagnostic tools we are facing globally,” Dr Bhakdi commented. Professor Dr O-Charoenrat confirmed that following a successful study, the test will become available through his practice, pointing out that the simplicity of X-ZELL’s blood-based approach will make it easy to integrate in existing diagnostic processes. *References: Cima et al., Science Translational Medicine, 8(345):345ra89. (2016); Lin et al., Scientific Reports; 7(1):9789. (2017); Bhakdi et al., manuscript submitted (2017). By combining the wisdom of 4,000 years of pathologic research with X-ZELL™’s own, cutting-edge technology, X-ZELL ensures robust results and maximum clinical utility across a broad range of medical applications – from research through to medication management, companions diagnostics, relapse control and diagnostic decision-making. X-ZELL is a fully integrated biotechnology company specialising in rare cell detection technology. Established in 2009 with investment from Vichit Suraphongchai – one of the leading figures in Southeast Asian banking – and support from Thailand’s premier science university, Mahidol University, X-ZELL first made headlines when it was accepted into Y Combinator’s ‘W15 Winter Batch’. X-ZELL used the opportunity to demonstrate the utility of its platform technology to reliably detect prostate cancer at an early stage, before it spreads, securing a rare Honourable Mention and funding by US start-up guru, Paul Buchheit – the creator and lead developer of Gmail – as well as six other Silicon Valley-based angel investors. Following a successful seed round, X-ZELL opened a Silicon Valley Office in Sunnyvale, CA, to support the company’s Global R&D Hub in Bangkok, Thailand and the soon-to-be-opened Head Office in Singapore. X-ZELL’s platform technology is already available to a limited number of universities and research institutions. In addition to prostate cancer, it is currently being applied to CTC and CEC detection in breast cancer, ovarian cancer, endometrial cancer and liver cancer.